The city of Los Angeles has nearly 4 million residents; there are just 9 public off-leash dog parks. With over 35,000 residents (and by some estimates 7,000 dogs), shouldn't Eagle Rock have its own off-leash park! One we can walk (not drive) to; where we feel safe; where we can get to know our neighbors and learn from each other as we watch over our dogs! Find samples here, here and here - or feel to express your own thoughts - BUT PLEASE DO SEND ONE! If enough do, it really could make the difference. Sign the Petition: To sign in person, visit Rock Dog & Cat, Julie's Dog Grooming, Leanna Lin's Wonderland, or Fast Tax Services - all located in Eagle Rock; to sign our online petition, visit GoPetition. Note: We plan to submit our petition to Councilman Huizar soon! Our goal is approximately 3,500 signatures - that's 10% of Eagle Rock's population - and we still need your help to get there. Make a Tax Deductible Donation: We need to show we are serious and that we want this. Parks take money, and we need to show we can raise it. Click here to donate now! 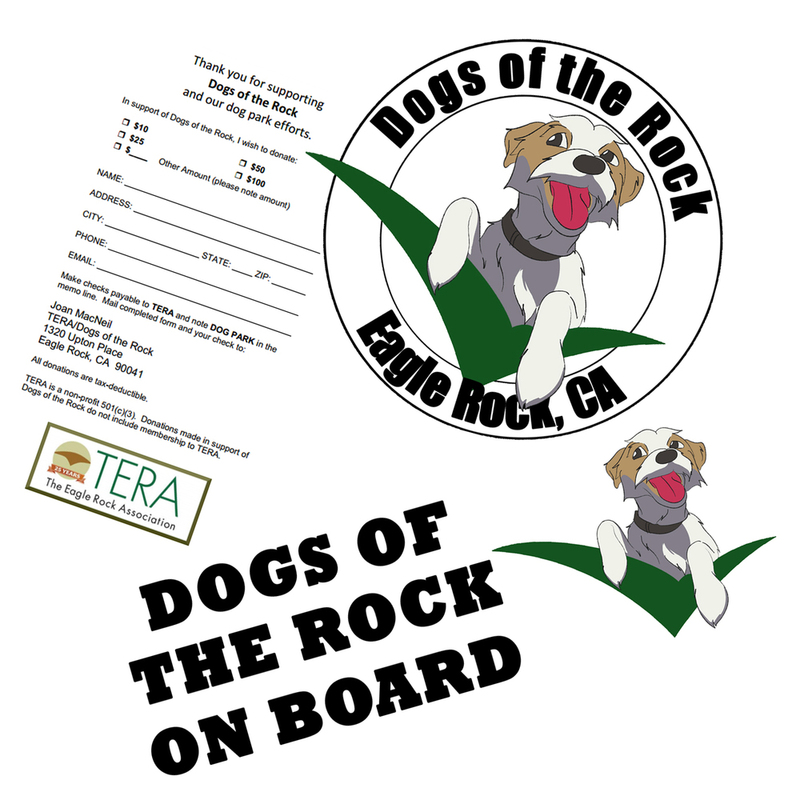 Since Dogs of the Rock has partnered with TERA your donation (of any size) is tax deductible! Doesn't that make you what to contribute? Additionally, we have an interim goal of providing biodegradable waste bag dispensers for the community (to the benefit of both those with or without dogs). As a community of dog owners and dog lovers our pets tend to be four-legged extensions of our families, so let's get together and make this happen for them! Thank you for supporting the notion of off-leash parks, not just in Eagle Rock, but in the city of Los Angeles!